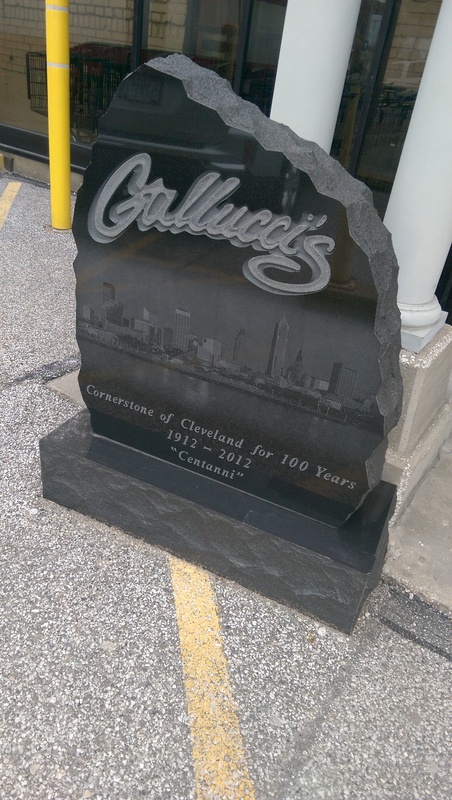 Gust Gallucci founded Gallucci’s Italian Foods in 1912 after he came to Cleveland in the early 1900’s and discovered a large Italian population who longed for products from their homeland. 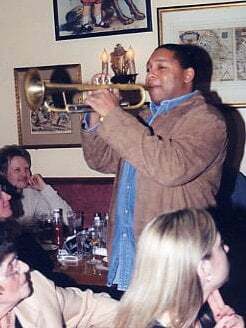 The store was originally run from a cart on the west side of Cleveland and changed locations several times until it found a home on Euclid Avenue and East 66th Street near downtown Cleveland in 1988. It celebrated its 100th anniversary in 2012 with a big centenary event, which included a dedication to the black granite monument you see at the front door. It is still family-owned and operated, now by the third and fourth generation of Galluccis. 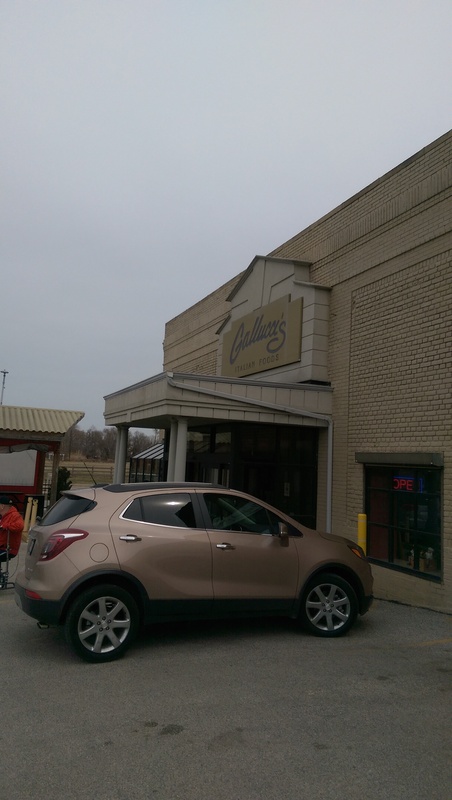 Gallucci’s is the place to go when you are looking for specialty Italian canned foods and treats. When you walk in you see the cash registers to your left and the deli and refrigerated and freezer cases to your right. The cases are filled with cheeses, salami and assorted charcuterie, butter, all the fixings for homemade pizza including dough, sauce, crumbled sausage, pepperoni slices and shredded and shredded cheese. 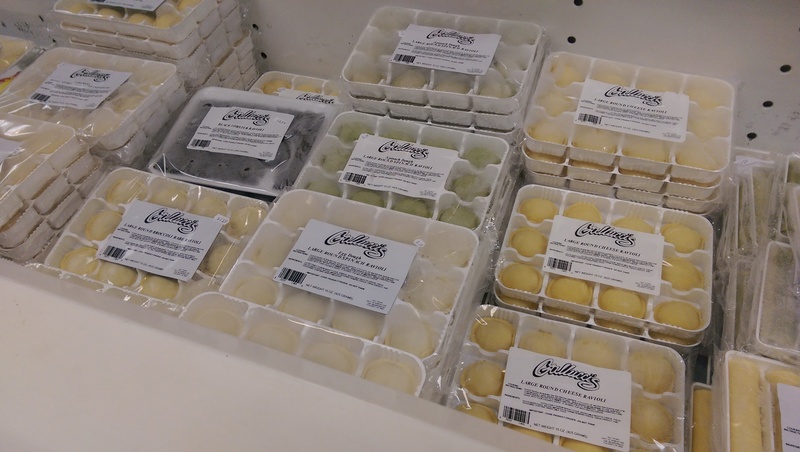 The freezers hold all kinds of frozen Gallucci pastas and seafood that you won’t find anywhere else as well as frozen soup, frozen meatballs (for wedding soup and for pasta dinners), and homemade gelato. 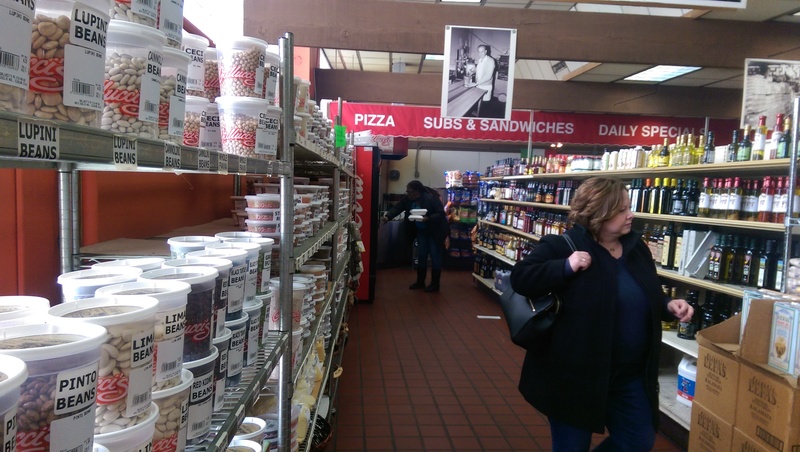 The grocery aisles are filled with boxed pasta, canned tomatoes, jars of sauce, olive oils, canned sardines, boxed cookies, Italian coffee, tons of bulk spices, espresso makers, and a good selection of wine. They also have fresh pasta and their canned sauce for an easy and quick home- cooked meal. The store carries multiples of the same product at different prices, to appeal to a range of customers. Their deli counter has all the specialties, whether it be prosciutto di Parma, Parmigiano-Reggiano cheese, soppressata, fresh mozzarella, burrata, guanciale, braciole, olives or anything else you may need for an authentic recipe. One recent Yelper warns about their practice of switching out cheaper brands for their brand though, so keep an eye out. 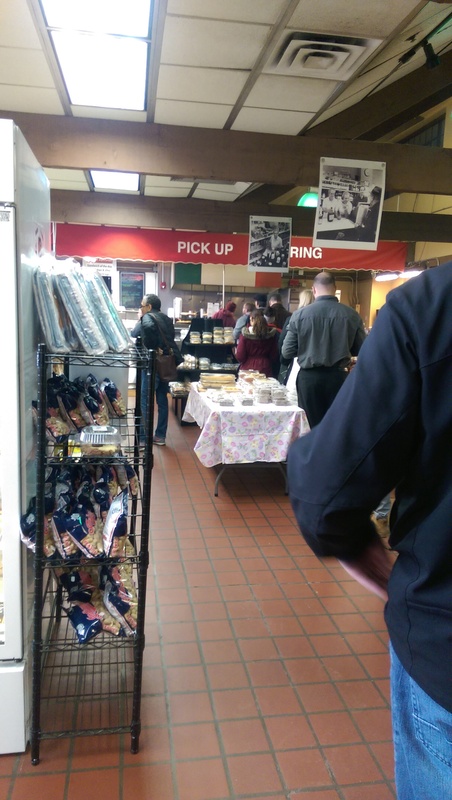 The bakery counter is next to the deli counter against the right wall on the way to the Hot Lunch Counter. The bakery counter has all kinds of Italian cookies and cakes as well as a cooler full of prepared submarine sandwiches (you need to get here early because they run out). I have been known to stock up on prepared subs if a snow storm is predicted. The olive bar is between the bakery counter and the cooler of sandwiches. You can get stuffed olives for $7.99 a pound, a mix of olives for $6.99 a pound and various other nibbles like pepperocini, giardiniera, etc. You can also have a sub sandwich made to order at the Hot Lunch Counter against the back wall of the store. The Hot Lunch Counter is open from 11 to 2 one weekdays and offers a lot of prepared carry-out foods for a quick lunch, like their daily lunch specials, a “sangweech”of the day, Italian sausage and meatballs for subs, salads, hot pizza slices, calzones, paninis, and several different pasta specials (lasagna and pasta and meatballs are usually two of them). 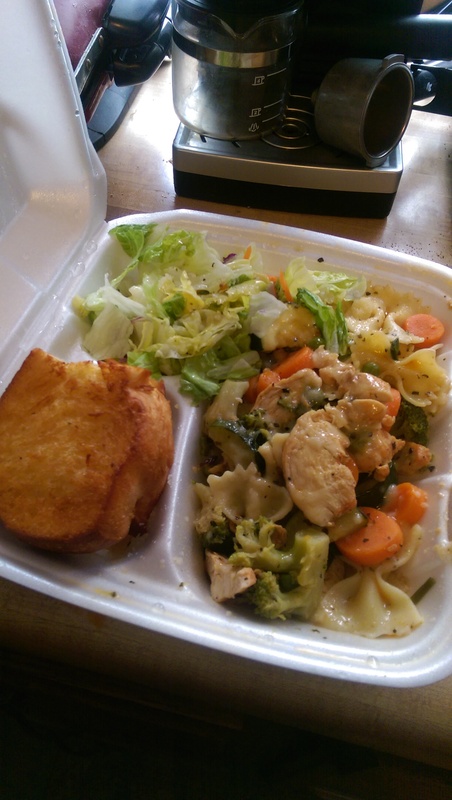 The pasta comes with choice of salad (tossed, potato or macaroni salad) and garlic bread. I just wish the containers didn’t leak. I damaged a library book when I accidentally pricked the styrofoam container and Italian dressing seeped out, and my shopping bag had a small island of sauce on the bottom when I got home today with my bow tie chicken pasta (see below). It had kind of congealed, so I know butter was in the sauce and it was delicious. You can also get Gallucci’s amazing Italian wedding soup by the bowl or the quart. It contains lots of meatballs and escarole – as well as lots of flavor. Gallucci’s also offers a daily lunch special (“Coke Special”) during the week. You can get a sub sandwich, a 12 ounce pop and a bag of chips for $6.99. Make sure the sandwich looks fresh though. The last one I got was pretty dried out. They offer frequent deals like Two Dollar Dog days during lunch from 11:00 a.m. to 2:30 p.m. in honor of the Indians Home Opener on April 1st (and it wasn’t an April Fool’s joke). 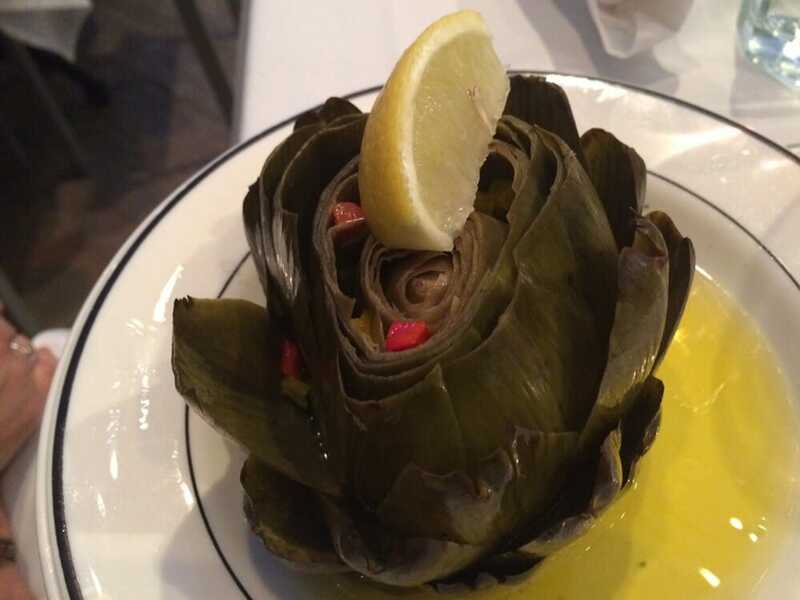 Did you also know that Gallucci’s offers hosted dinners with Chef Chuck Masterpaul? I didn’t know until I checked out their website. The next scheduled one is April 24th. The hosted dinners include exclusive access to the store, wine pairing and product suggestions, and consultations with Chef Masterpaul. The cost is $50 per person. 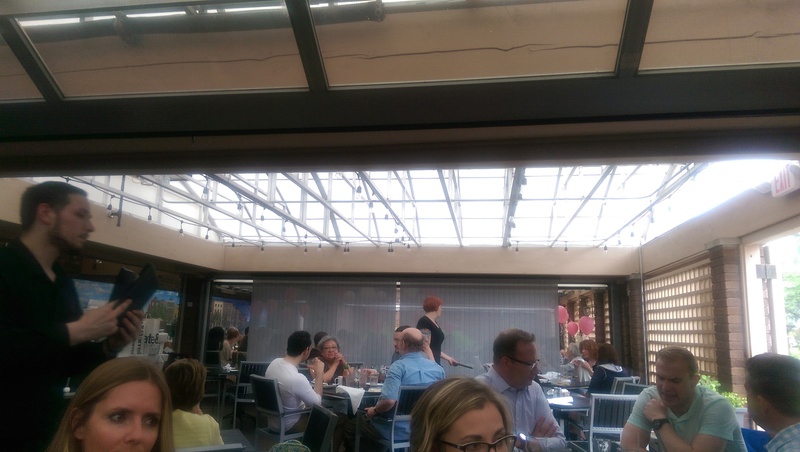 You can subscribe to their various email lists (including the daily lunch specials) here. Luchita’s has been in my awareness since it opened in the 1980s. My father used to work at Richman Brothers with Luchita’s son-in-law, Tedd. He would talk about Luchita and her cooking. I didn’t get a chance to try it for myself until after I moved back from Germany in the early 2000s. Luchita is long retired, but it is still family-run. From the outside, Luchita’s looks like a dingy corner bar in a working-class neighborhood, but magic happens inside. 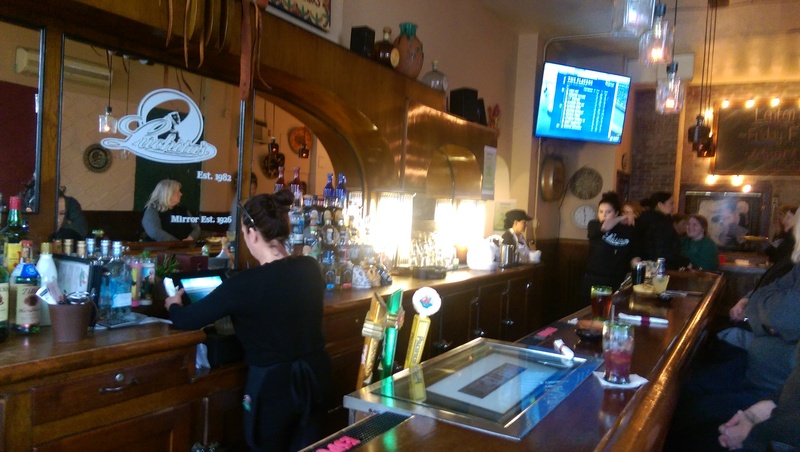 Luchita’s is one of Cleveland’s best Mexican restaurants. I learned about Luchita’s fish fry last year in one of my food groups. Since I am a sucker for Mexican street corn I knew this had to be on the list this Lenten season. I got a group of friends to trek to W. 117th in Lakewood to enjoy this delicious and out-of-the-ordinary fish fry. I made a reservation because they want prior notice for tables of 6+. My one friend and I carpooled together and got there very early because we were expecting heavy traffic on the roads. We arrived 40 minutes before the 6:30 reservation, so we parked ourselves at the bar and had a margarita and dished all things Broadway. The margarita was freshly made, but I was less than impressed with it. It tasted mostly like ice/water. 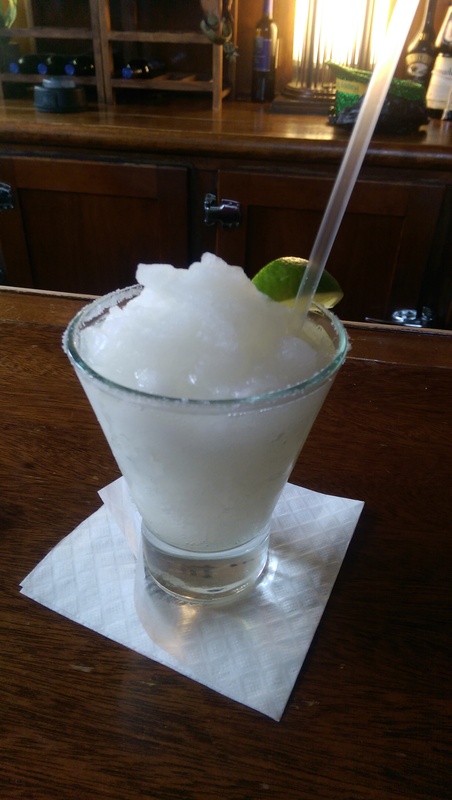 I’ve had good margaritas at Luchita’s before, so I’m going to chalk it up as a one-off oops. Once two more in our party arrived we were shown to our table in the adjacent dining room, even though we were still before the 6:30 res. We managed to order another round of drinks after we sat, and I decided on a sangria. This was definitely the better choice. One of my dining companions upgraded the tequila and enjoyed her margarita. We fell on the delicious chips and salsa like a bunch of locusts. By the time our other friend arrived the server brought us another salsa and chips. The chips are warm and inviting, and the salsa had a nice kick and flavor to it. 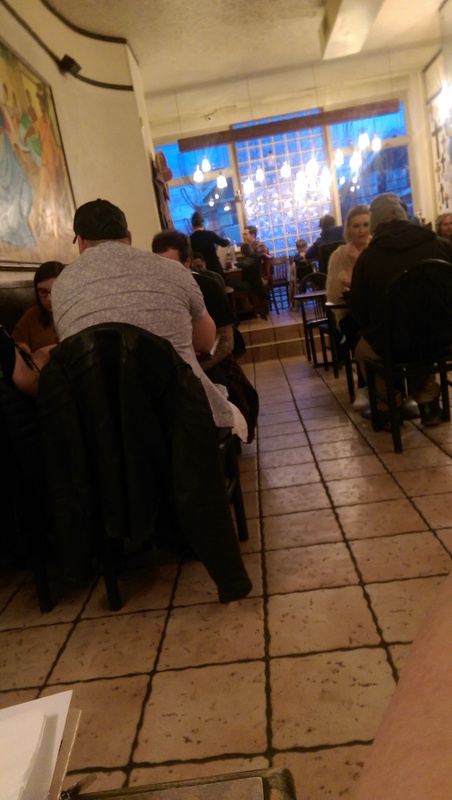 I am embarrassed to say I filled up quite a bit on that salsa – and had a couple of bites of a side of delicious and creamy guac one of my dining companions ordered. We were there for the fish fry, so we did not bother perusing the menu closely. 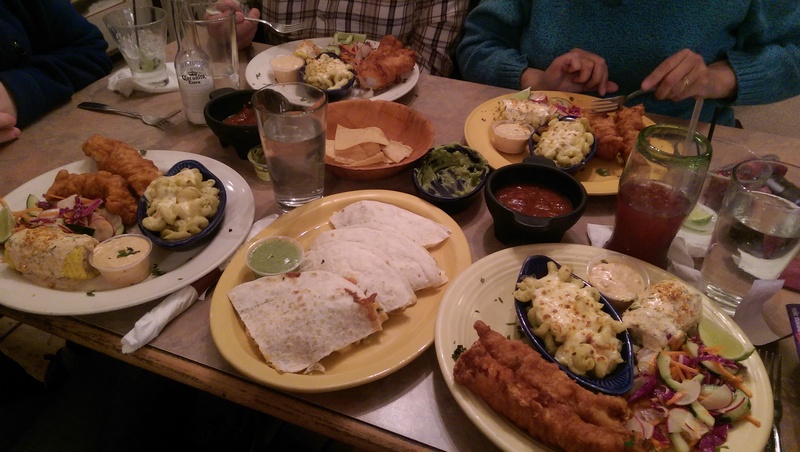 All five of us ordered the fish fry, which made our server’s life easier. The fish fry features beer battered fish, chipotle tartar sauce, Mexican street corn, mac & cheese with salsa verde, and a cucumber-radish-carrot salad that was delicious. The fish was perfectly fried and not too greasy. The Mexican street corn was just a delicious mess. I ended up wearing it down the front of my shirt and had to wash my hands. The mac n cheese was a nice version of noodles covered in a cheese with a bit of a kick to it. The cavatappi were not overcooked, and the noodle to cheese ratio was just right. I have no idea what was in the dressing for the salad/slaw, but we all agreed that it was fantastic. The dinner was $17.95 and worth it. I couldn’t make up my mind, so I also ordered the lobster and shrimp quesadilla. I figured we could all eat it as an appetizer, not realizing that it was a dinner portion size. 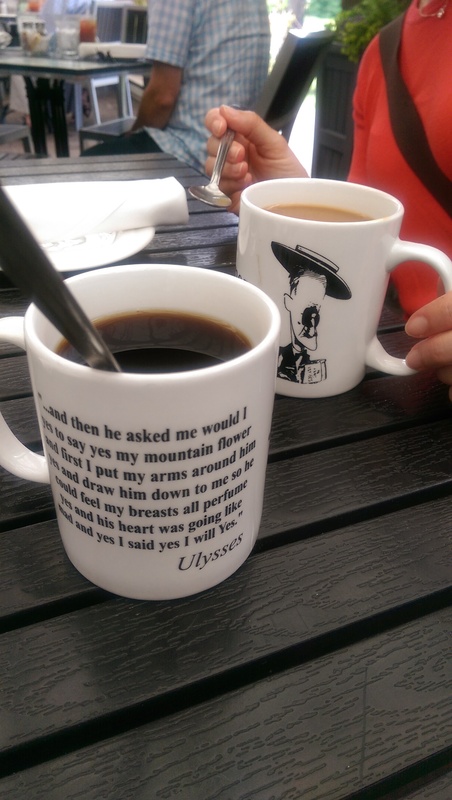 I should have known it would be a lot when the waitress was taken aback when I ordered it. It was filled with large chunks of lobster and shrimp, and I really, really loved every bite. Be forewarned: the quesadillas were $18.95. 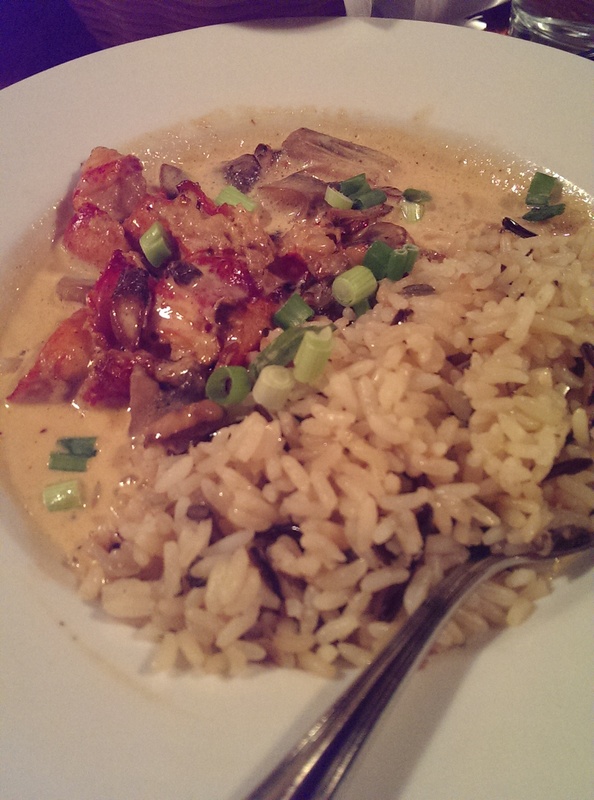 I was surprised when I got the bill, but it truly was worth it with the chunks of seafood. We rolled out of there with boxes for our leftovers and happy stomachs. If you are looking for a good fish fry and love Mexican definitely check this place out! 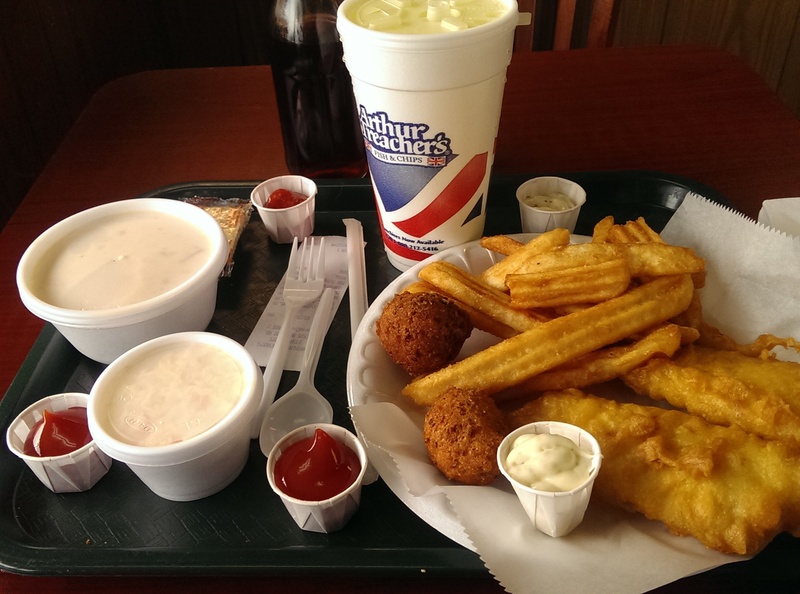 Arthur Treacher’s Fish & Chips is a fast food seafood restaurant chain. At the peak of its popularity in the late 1970s, it had about 800 stores. 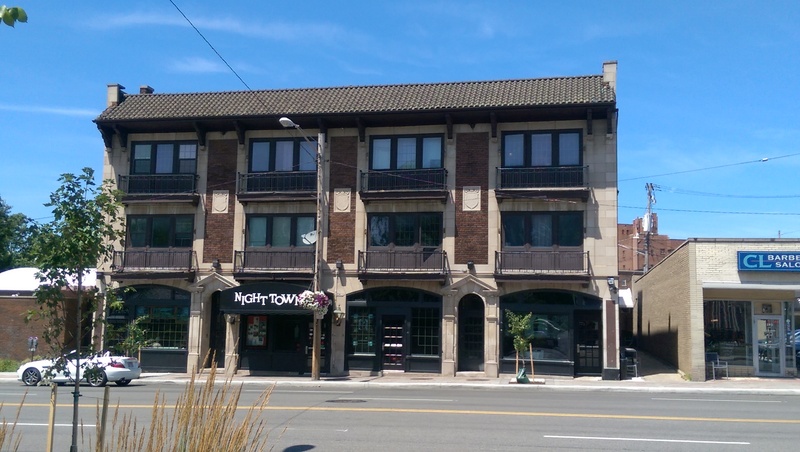 Now, there are only four of the original old-style stores left – all in Northeast Ohio. The busiest is on Rockside Road (near the intersection wtih Turney Road) in Garfield Heights. 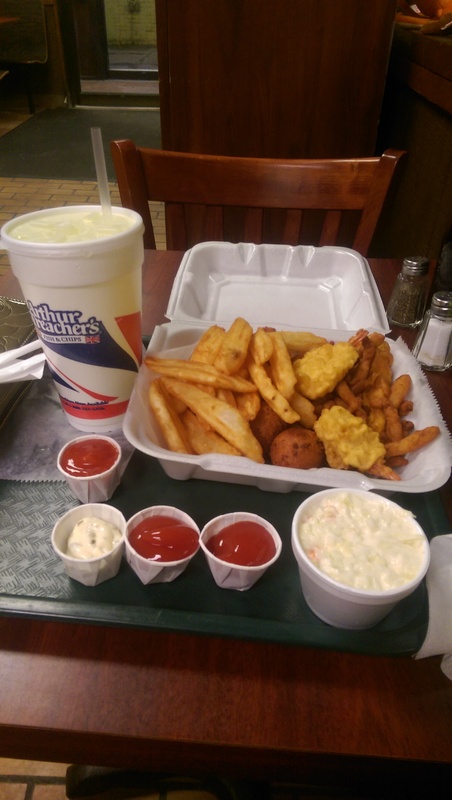 I love going there and reliving my childhood memories of fried fish and that amazing cole slaw. I went a long time without eating there, and just one bite of the cole slaw had me realizing that it was the cole slaw I had been comparing all other cole slaws to. It is a nice, wet, mayo-ey cole slaw, which I prefer. 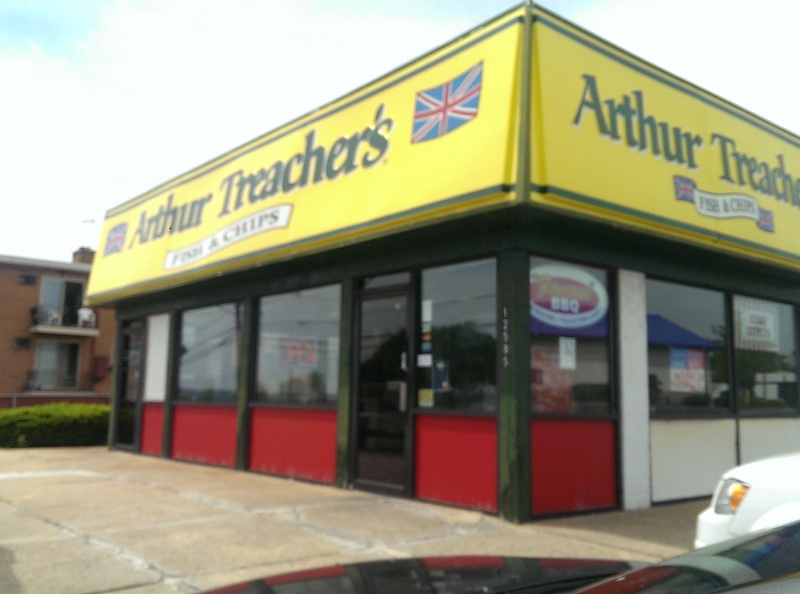 Things have not changed much at Arthur Treacher’s. The decor is firmly from the 1970s – as is the carpet. The food is still served on trays, and the condiments are pumped into little paper cups. You have your choice of ketchup, tartar sauce and cocktail sauce. I wish they wouldn’t use so much styrofoam, but understand their business model hasn’t changed since the 1970s so why wouldn’t they. I made the mistake of going there on Good Friday once. That is probably their busiest day of the year. The line was almost out the door and didn’t let up the whole time I was there. Business had slowed down until the Cleveland.com article in 2016 and then news of its existence also hit social media, so they are happy to report they are doing well. It’s apparently become somewhat of a tourist attraction, with people traveling there from far away to experience it again. The food still stood up to my memories. It isn’t gourmet, but childhood memories rarely are. I ordered the chowder, a fish and chip combo and a side of cole slaw. I can never finish the meal here and always bring half of it home. The fish is better than some of the fish I’ve had at other fish fries – flaky with a light batter. The chips are satisfying and made my British friend happy and “more at home” than most chips. And I usually save a hush puppy as my last bite. I really enjoy the sweet flavor yet savory texture of the perfectly fried hush puppies. I ordered the fish and chicken dinner here once, and although it was okay I will continue to order the fish. It was too jarring for me. Chicken doesn’t seem to belong with all the seafood, but I guess folks who don’t like fish or seafood have to eat too. I like the fried shrimp. They are plump and well fried without drying out. I am less enamored with the clam strips. They tend to get dried out and are a little too chewy for my tastes. I can also recommend the seafood chowder. The first time I ordered it I don’t know what happened but it had an overwhelmingly metallic taste. I gave it a second chance the other day and enjoyed it. I’m a sucker for a decent chowder. Akron isn’t necessarily Cleveland, but if it’s good enough for Akron native LeBron James to be from “Cleveland,” then I can certainly feature a restaurant in Akron here. 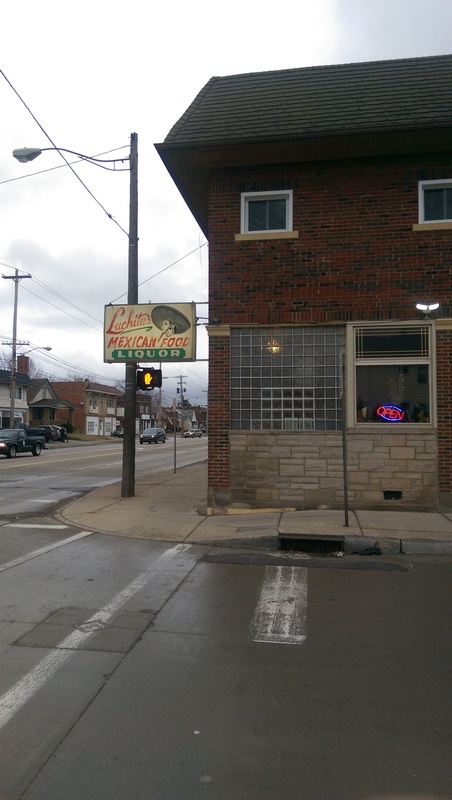 Luigi’s is an institution and has been an Akron tradition since 1949. It is open 7 days a week for lunch or dinner and is open until 2 a.m. on Fridays and Saturdays (they recently changed to a 2 a.m. close time instead of 3 a.m.). Beer and wine is served until 1 a.m. Reservations are not accepted, and they only accept cash or “local checks.” I’m not sure if they consider Cleveland local. In any event, I first started coming here when I was in grad school at Kent State University. Luigi’s is about as old school Italian as it gets. 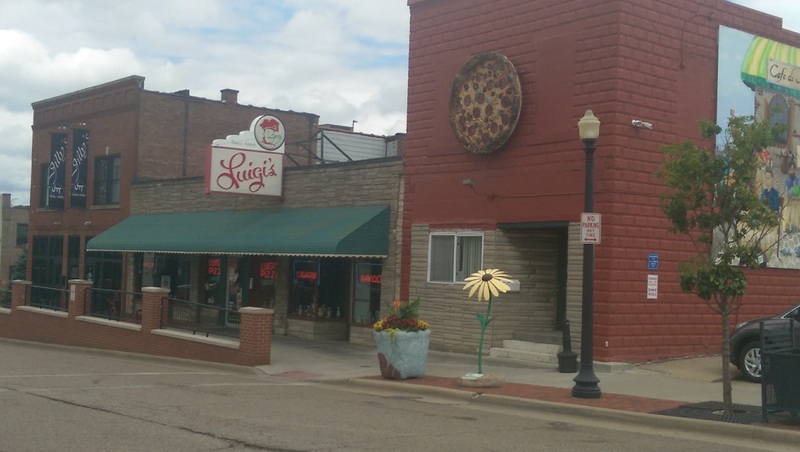 It was also the inspiration for Montoni’s Pizza in the Funky Winkerbean and Crankshaft comic strips, including the bandbox over the front door. Cartoonist Tom Batiuk was born in Akron and attended Kent State. Luigi’s is not gourmet, but it is good, solid, stick- to-your-bones fare. It’s extremely traditional. The tabletops are melamine, the menus are checked, the walls are fresco paintings, and the wood is dark. Most nights there is a line for a table out the door, so I tend to go during the lunch hour or off hours. They have great lunch specials until 3 p.m. But if you do find yourself in a line you will not be waiting for hours. The line moves quickly with several dining rooms available. Luigi’s is known for its salads, because it has a ton of whole milk mozzarella cheese with a little iceberg lettuce, black olive and sliced radish underneath. 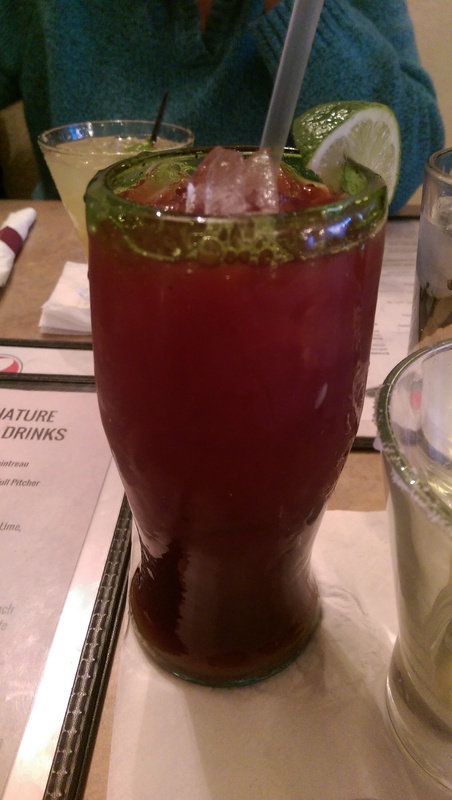 Paired with their House Italian dressing, it is a nice balance to the heartier pizza and pasta they serve. The antipasto salad features salami, pepperoncini, olives, tomatoes, radishes, and mozzarella cheese. You can also add pepperoni, tuna or anchovies for an extra price. The complimentary bread is a really nice Italian bread, with a nice crust yet chewy center, served with packs of butter. One of the best lunch specials around is the “slice and salad” combination. 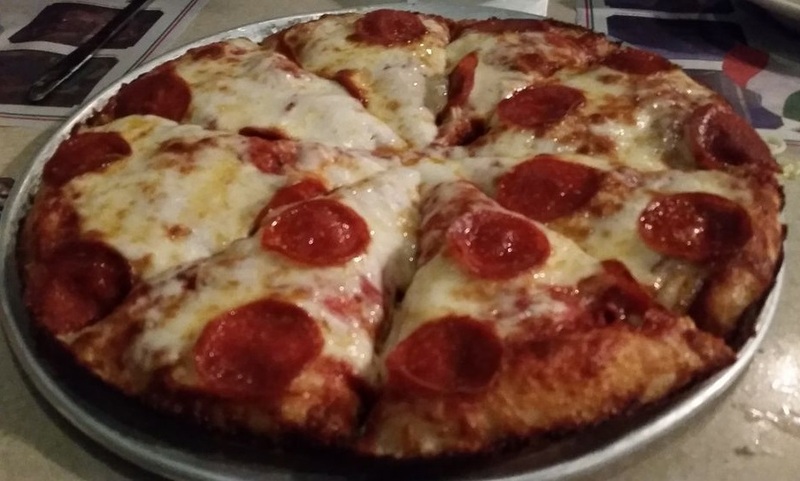 You get a small salad and a slice of pepperoni or cheese pizza for $4.35. Not bad for such a low price. I have always loved their pasta. Spaghetti, rigatoni, ravioli – it’s all good to me. 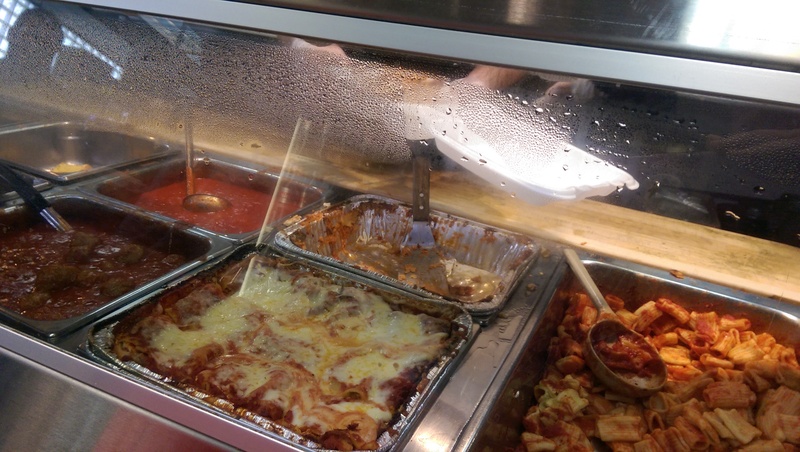 My go-to order has always been the Baked Pasta Combo (but be sure to emphasize the Pasta because you might find yourself served a Baked Combo Casserole, which is a baked meatball and sausage combo with no pasta in sight). It is a nice choice when you can’t decide if you want rigatoni or cheese ravioli. The pasta comes either with marinara or meat sauce. It is then covered in cheese and baked. The sauce is not spicy, but it is very good. I recently ordered the Baked Florentine Ravioli on a whim and fell in love. It’s a spinach ravioli with a filling that is somewhat reminiscent of the Stouffer’s spinach souffle. The ravioli are not jammed with filling, but there is enough that it is a tasty ravioli. I ordered it with the meat sauce and loved every bite. I will be ordering this again. The pizza also comes in two sizes – small (4 slices) or large (8 slices). The large is not as large as you might think, but it’s enough for a couple slices per person. The pizza is fairly unique. I think the pizza is fairly reminiscent of a Detroit style pizza, in that it is a flat pan pizza with a high rising crust. The crust has a nice crunch to it and yet it is sufficiently doughy for this thick crust lovin’ gal. I prefer the red sauce pizzas with a little meat instead of the Bianco or plain cheese pizzas. The meat and toppings balance out the tomato of the sauce. The cheese pizzas tend to overwhelm the sauce too much. If you prefer to take your meal to go, they offer parbaked pizzas that you can bake in your oven at home for 10 minutes. Most people complain about the fact that you have to pay cash (although they do have an ATM). As long as you are aware of it ahead of time and bring cash with you you’ll be fine. The prices are so low that you won’t be shelling out a ton of money on your meal. I recently ordered a dinner sized baked pasta, small tossed salad and two small pizzas (to go), which easily fed two people and another meal besides, and my bill was $37.45. And line up they do. We got there at 5:30 and the line extended all the way to the back of the building. Luckily I figured it would be bad and we entered using the door where the line started (the door is in the center of the above photo – it kind of looks like a chimney from here). My friend and I chatted with each other and with the folks around us. One older lady (she must have been 80 years old) was a total hoot, talking about marching in the St. Patrick’s Day Parade and trying to convince me to give Dyngus Day a visit. Her husband, who she had been with for 60 years, is a die-hard Indians fan and was flying to Arizona the next day to watch them train. We finally found ourselves under the Smacznego sign at 6:15. 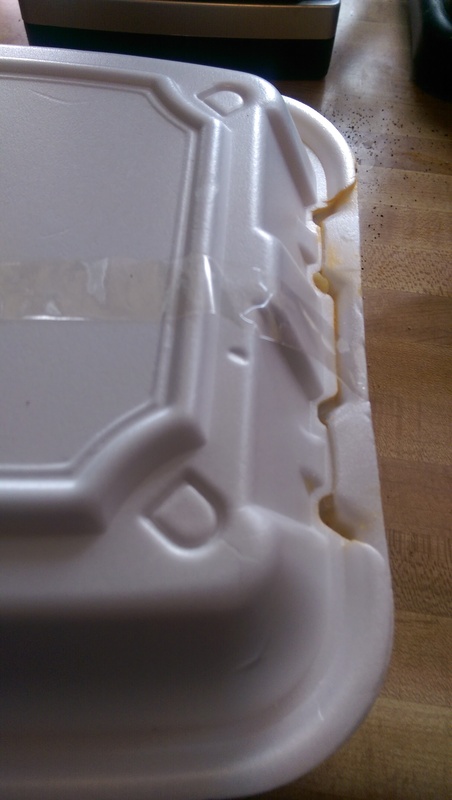 We grabbed silverware, napkins and a tray and started sliding down the line. The desserts were tempting, but I knew I wouldn’t have room. I grabbed a Sprecher’s Orange Dream soda from the bin and continued on my way to the steam trays. 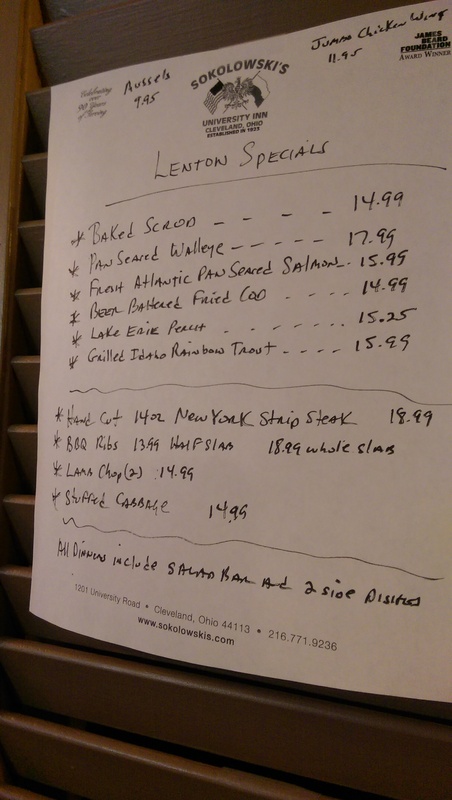 My friend and I decided to get a Lake Erie perch dinner and a grilled rainbow trout and were going to share them. Once we got to the steam trays and saw the gorgeous beer battered cod we quickly changed our mind. We quickly had to decide which one not to order. I ordered the cod, and when they brought out fresh fried perch the decision was made really quickly. I grabbed a dinner roll and my plate of food (beer battered cod with pierogi and corn), loaded up on butter and sour cream, and paid my bill at the cash register. We told the guy carrying our trays how many people would be in our party, and he accompanied us to a table. My friend headed to the bar for a beer, while I headed to the salad bar. My friend who ordered the perch with me also enjoyed both the perch and cod. She loaded both up with lots of lemon juice. She peppered up the mashed potatoes and also thoroughly enjoyed the pierogi. We both knew what to expect and enjoyed our meals. Two more of my fellow diners arrived late and were seated with us after I explained by text where we were sitting. They had never been there before either and didn’t know what to expect. They were surprised to see such a long line, but they took it in stride. 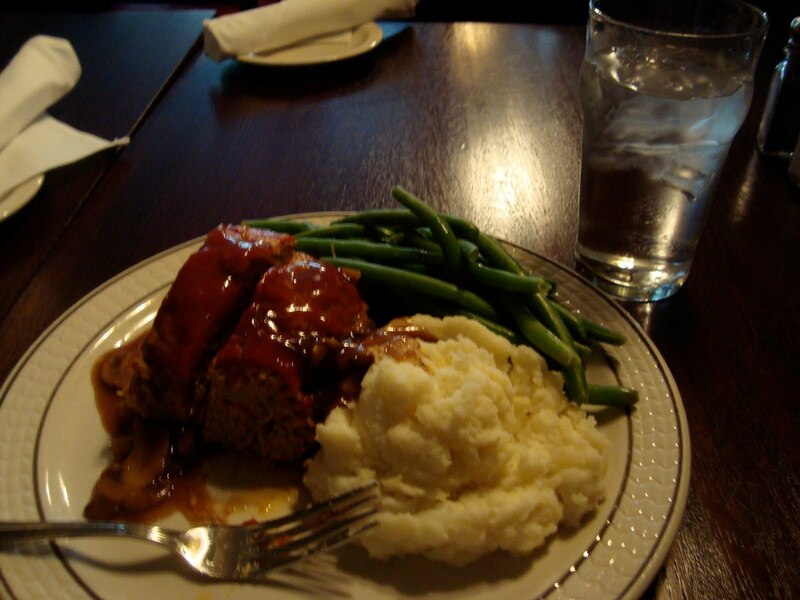 In addition to giving her a few dining recommendations, one of guys in line with them recommended she get the Salisbury steak, so she did. It did look pretty amazing, and even though she had made meatloaf the day before she enjoyed it very much. She got the full-on carb experience – Salisbury steak, pierogi, cabbage and noodles and rice pudding. Right on! Apparently the rice pudding was a mix of rice and bread? Her friend ordered the lamb chops, which the food runner called “little steaks” along with the pierogi. She said they were good. We got a chuckle out of the mint jelly, which I had thought was green Jell-o. They both got boxes as well – and my one friend got a meal to go for her son – complete with a to go box for the salad bar for him (which you can see in the photo to the right). Everyone left fat and happy, having enjoyed their meals. I don’t know if I would go for dinner again on a Friday during Lent (because they serve their fish specials every Friday throughout the year), but the line moved slow enough that there were always a few empty tables available. When we left around 7:30 the line had died down considerably (extending up the stairs but not through the dining room) and there were more available tables. They had run out of scrod by 6:30 though, so it pays to get there earlier rather than later. I missed last week because I was sick, so even though it says fish fry #2 it is week 3 already – we’re already halfway finished with Lenten fish fry season. They say old-time neighborhood holes-in-the-wall serve the best burgers and fried fish. 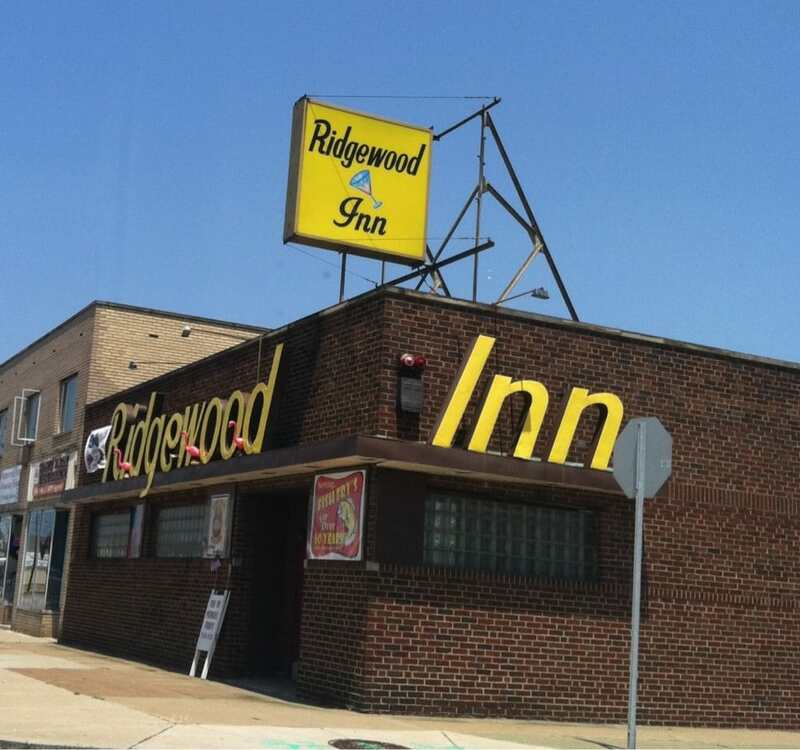 They would be right when it comes to the Ridgewood Inn. It has a lot of old-time ambiance. Dark red walls and wood. They were screening old Charlie Chaplin movies (including The Great Dictator) on one TV while playing tunes from the 1950s over the speakers. The place exudes “dive” from the worn chairs to the paper placemats. Located on Ridge Road just north of Snow Road, it was easy to get to from the Heights taking I-176 and I-480. Parking is easy. 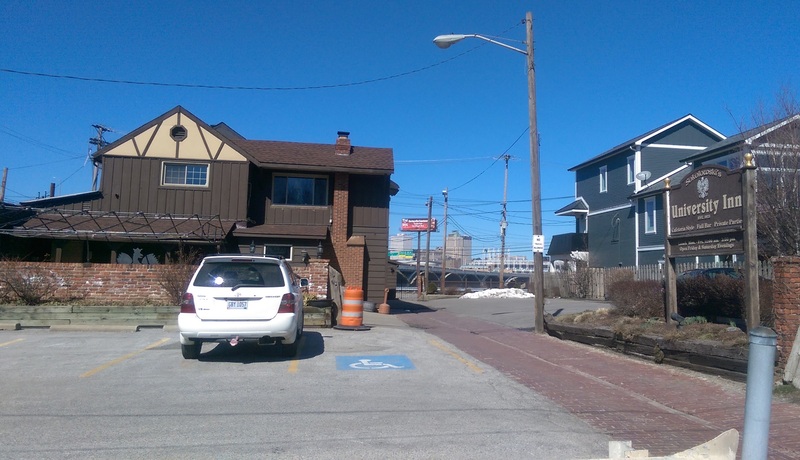 The lot behind the building was full, but there was a sign directing us across the street behind Barabicu Smokehouse. I entered through the front, but there is a back door from the parking lot. The staff was friendly. Our server has worked there for 17 years and it showed in her no-nonsense service. They make the food as they go and it seems as if the kitchen is small. We were not in a hurry and weren’t offended when half the table were served their food and the other had to wait for the next batch. During Lent they serve a limited menu – all seafood – from 11:30 a.m. to 8 p.m. We went at 1 for lunch to make sure they didn’t run out of anything. It was easy to hear everyone at that time, but I’ve heard of lines for dinner during Lent. If you want cheap classic beer and drinks and want pierogi that will fill you up and then some, all for a great price then this is the place for you. 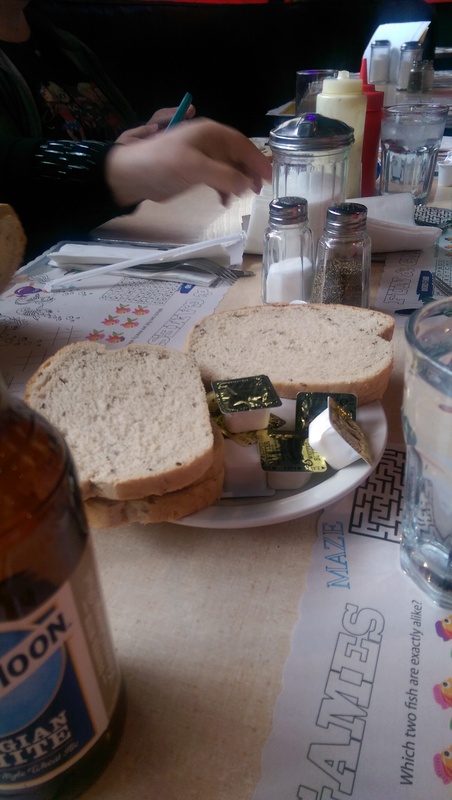 First things first, we ordered drinks, and the server brought out a plate of soft rye bread and semi-soft butter pats. I had two slices of bread slathered with butter and had to refrain from eating more. I was the only one of my group that ordered a beer, but I figured it would go nicely with the fish. I also ordered a ginger ale to make sure I didn’t drink my beer to fast. 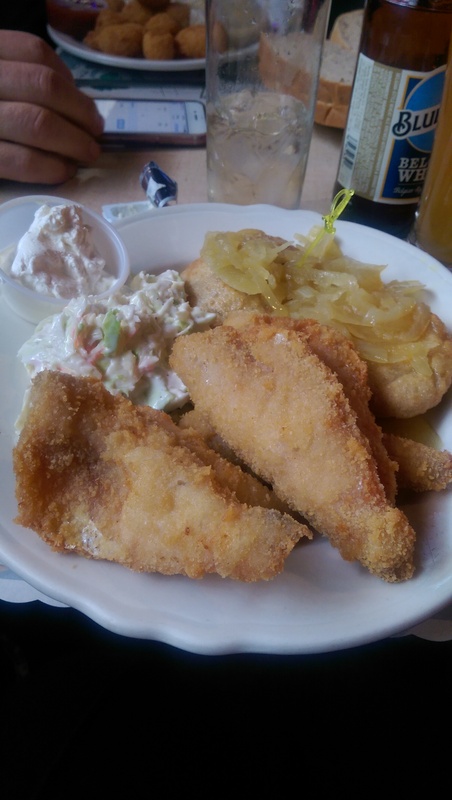 They serve a nice selection of fish – Sauger pike, beer battered cod, yellow perch, and baked scrod. I ordered the yellow perch, which wasn’t on the printed menu but was on offer if you knew to ask for it. 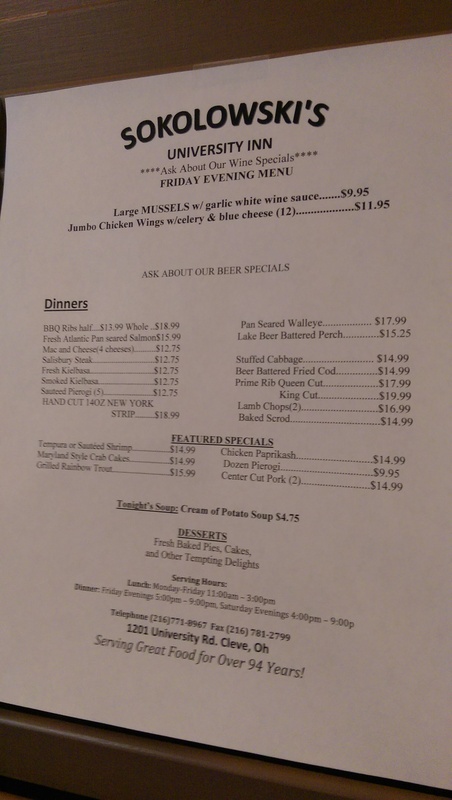 I got five pieces of perch, two pierogi (one sauerkraut, one potato – fried instead of boiled), and coleslaw for $16.50. A little ramekin of sour cream was 35 cents. The perch were nicely fried and were not greasy. The pierogi were deep-fried to perfection with lots of butter and caramelized onion. The sauerkraut pierogi was indicated with the little yellow sword. I think I liked it better than the potato pierogi, which is saying something. The sauerkraut was nicely caramelized and sweet, not sour. The coleslaw was a nice, creamy version that I enjoyed a lot. I was very tempted to order the fried scallops, because you rarely see fried scallops on a menu anywhere. The choice of fried scallops, fried clam strips or fried shrimp. 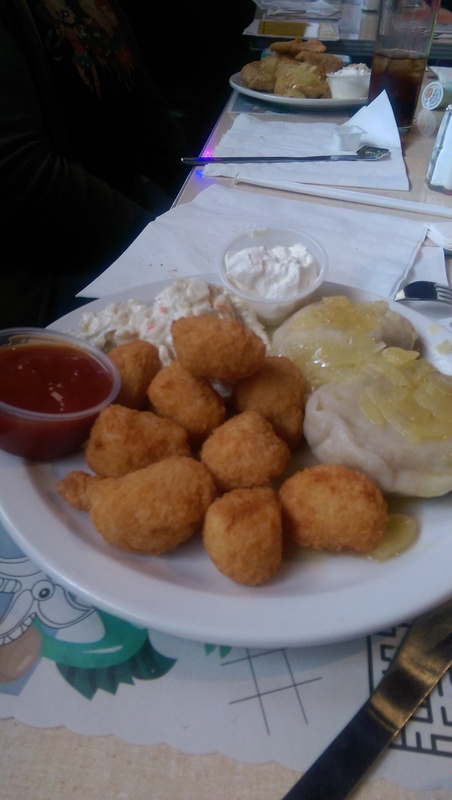 My friend ordered the fried scallops with two potato pierogi (boiled) for I think around $13.50. I ordered one to go for later with the boiled pierogi and enjoyed the sweet, deep-fried nuggets a lot. Some of my friends were not that impressed with the pierogi, which were rather large and a little tough. I think the deep-fried pierogi were better than the boiled. They seemed a bit more tender. All of the pierogi were obviously handmade. But if you ask me any pierogi is a good pierogi (except maybe Mrs. T’s). They also serve half orders of their fish dinners available as well that come with half the fish (2 1/2 or so), one pierogi and coleslaw. One of my other friends ordered that because she was hard-core and meeting friends with her husband that night for another fish fry. One of my friends ordered the large cabbage and noodles ($4) to share, and it was a really nice, tender, flavorful version with well-cooked cabbage and noodles. The server was really good and reminded me not to forget my fried scallops to go. She kept our drinks refilled and was on top of anything we needed. We were able to get an extra plastic bottle of tartar sauce for our table, and she even brought us a plate of lemons when someone asked for them. 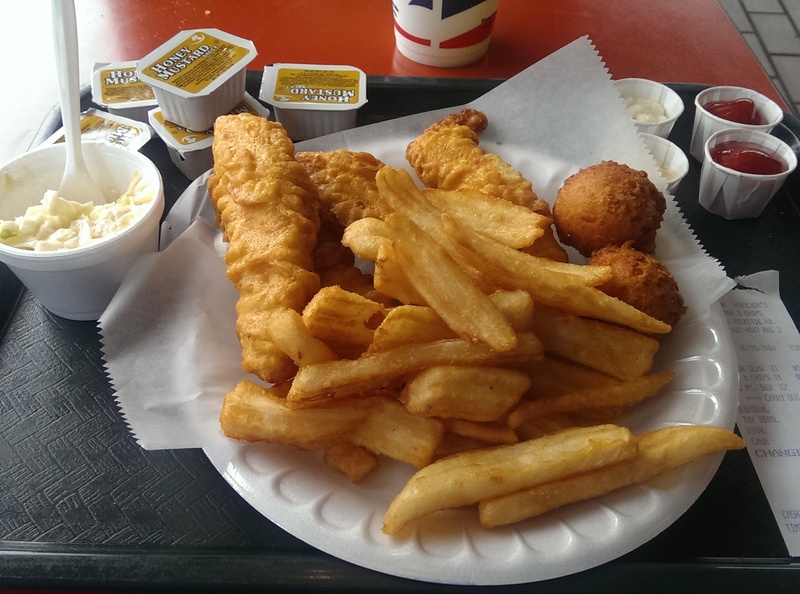 Everyone enjoyed their fish fry lunch today and hitting some of the spots in the area like Barabicu, Rudy’s and Chuppa’s afterwards. I went home to take a nap since my power went out at midnight the night before and had just come on when I left to meet them for lunch at 12:30. My verdict: it wasn’t the best fish fry I’ve ever had, but it was a nice solid choice.